Join one of the largest all European car gathering on the west coast. Over 3,300 European car lovers in one place. For more event info go to BIG-EURO.com. General admissions is Free but for those that want a premier spot to showcase their vehicles, VIP Parking is available. Join one of the largest all European car gathering on the west coast. Over 3,300 European car lovers in one place. For more event info go to BIG-EURO.com. General admissions are Free but for those that want a premier spot to showcase their vehicles, VIP Car Show is available. General Admissions - It's free! General Parking is free! That's right. It's all part of the event. Of course we'd encourage people to join our VIP Car Show, Audi Fest & Drag Racing. Crowd Judged - What does that mean? 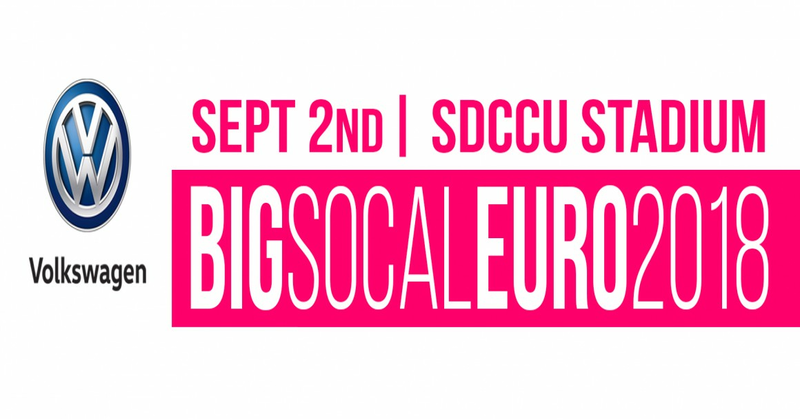 Well it means that all the attendees of Big SoCal Euro will be able to vote for their favorite cars at the event. We will be using SMS voting system to allow everyone to judge for your top cars. So it is judged by crowdsourcing. The judges will be you! VIP Car Show gives you an exclusive parking in front of vendor exhibition area. We have moved the VIP Parking to front and center. Please reference the event map below. Please note that VIP Car Show is designated for European vehicles. Also, this year we will have a People's Choice Car Show with Awards. More info to be posted on the website. Please make sure you setup any canopy/tents in designated Tent City area. Includes coupon to redeem (1) One Raffle Ticket, (1) Two For One Jamba Juice Drink, and more. Audi Fest is the union of 4 Ring car enthusiast throughout the West Coast. We have allocated a large section of the venue to showcase the Audi brand marquee. Includes coupon to redeem (1) One Raffle Ticket, (1) Two For One Jamba Juice Drink, and more. Drag Racing is good for all-day racing on our 1/8 mile dragstrip hosted by RaceLegal. Drag Racing is open to all makes & models (non-euros included) Helmets required! For full details, requirements & drag racing info, click here. What do I do with my VIP Car Show & Audi Fest registration? #2 - Fill out Car Show registration form and submit at Check-in. #3 - Place VIP Decal on Front Windshield, also place Car Show plaque on dashboard of vehicle. Instructions for Voting will be on plaque. What do I do with my Drag Racing ticket?